TPC at Sugarloaf Bellsouth Classic golf Lucas yardage book views of 18th hole. Professional golf tournament Yardage Books for the PGA Tour are measured and produced by *'Gorgeous' George Lucas. These views are excerpted from a 2003 Bellsouth Classic at Sugarloaf Lucas Book. 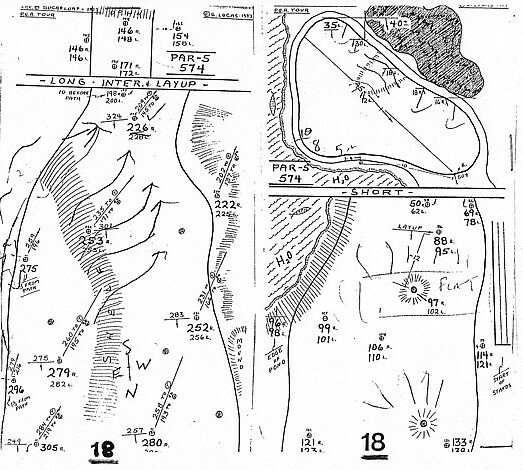 At the top is image of the overall view of the 18th hole, the second page is the left vertical image of the long yardage and lay-up play of the hole. The last image (lower right vertical page) is of the lay-up area and the green of the golf hole. *George Lucas has produced the PGA Tour yardage books for the past 25 or so years. He is a former caddy and one of the pioneers in golf course yardage book development.